Whether you ride or not, public transportation benefits all of us. It reduces pollution, eases traffic congestion, and helps our communities thrive. In cities, suburbs, and rural America, public transit provides vital connections to jobs, education, medical care, and our larger communities. Help us keep America moving. Is Your Community on Board? 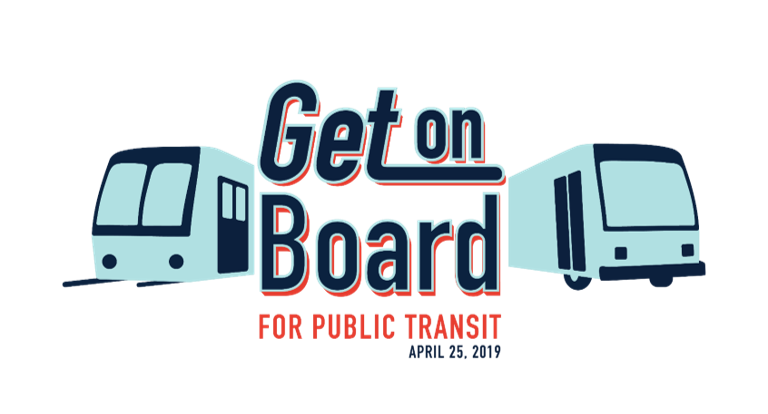 Communities of all sizes and transit systems around the nation will celebrate public transportation’s role in American mobility during the inaugural National “Get on Board” Day. This one-day nationwide event will bring attention to the societal and economic value of public transportation. This event will raise public transit’s profile, emphasize how public transit is the foundation of a forward-looking mobility strategy, and make the case for increased investment in public transportation to elected officials. In our previous blog post, encouraged Voices for Public Transit advocates to share why they are personally “On Board” with public transportation, but that’s just the beginning of the story we need Congress to hear. Jobs!—Every $1 billion invested in public transportation creates or supports approximately 50,000 jobs. Economic and Community Development—Public transportation attracts business investment, builds tax revenue, and fosters affordable housing. Did you know that 70 percent of public funding for public transportation reaches the private sector? That figure alone should convince communities off all sizes to “Get On Board” when it comes to public transportation. Public Health—Public transportation supports healthy communities. We’re not just talking about the public transit riders that get exercise by walking to their stop or station. Public transportation provides a critical link to hospitals and medical centers so people can access healthcare—especially preventative care. The U.S. Centers for Disease Control and Prevention recommends expanding public transportation because of its contribution to public health. Quality of Life—Public transportation reduces traffic and air pollution, gives people more flexibility and access, and brings folks together so members of the community feel more connected. What Can You Do to Get Your Community On Board with Public Transit? Start by showing us what public transit does or could mean for your community: post photos or short videos of public transportation in action in your community on our Facebook page or Twitter using the hashtag #GetOnBoard. Does your bus or rail system connect students to a local college or university? Are new housing or new businesses growing up close to public transit? Has public transportation helped revitalize an older neighborhood? Do you see people in your community using public transportation to shop or attend community events? We know many communities don’t yet have robust public transit or have outgrown the public transit systems they currently use. Those stories are just as important to tell! What public transit improvements are on your community’s wish list? Share more with us today! Are You “On Board” for Public Transportation? Save the Date! April 25 is national “Get on Board” Day. So what exactly is “Get On Board Day” and what does it mean for you? Great question! Public transit systems and mobility champions will be uniting to raise awareness about the importance of public transportation. We’ll be highlighting the economic, social, cultural, and safety benefits of public transportation—and why we all need to “Get On Board” when it comes to investing to improve and expand public transportation in communities large and small. You already know public transit matters at three key levels: personally, for local communities, and for the nation as a whole. Together, those stories—the personal, community-wide, and national—make up the 1-2-3 of why public transit matters, and each plays a role as we work to show the new Congress why they need to keep public transportation at the forefront in their infrastructure and transportation discussions. Let’s Start at the Beginning: #1—How Do Strong Public Transportation Networks Benefit You? Easier Connectivity: Buses and trains help reduce traffic congestion for drivers; cabs and rideshare services make it more feasible for people to walk and bike because they will have other ways of getting to their destinations if weather or other conditions change. Flexible public transportation makes getting around easier for everyone. Greater Safety: Public transit-oriented communities are five times safer than communities centered around vehicle transit. Better public transportation creates more compact development and integrated communities, which in turn reduces auto miles traveled and produces safer speeds in those areas. Financial Benefits: The average household spends 16 cents of every dollar on transportation, with most of the money going toward buying and maintaining a car. Households that use transit and give up a car save nearly $10,000 annually. Healthier Living—It’s easy to be more active when you use public transportation. Most riders walk to their stop or station, and many combine bicycling and transit. Traveling by public transportation is also 10 times safer per mile than traveling by car. How do YOU benefit from public transit? Tell us how YOU Get On Board with public transit, even if you don’t ride! Your story could be featured on our website and social media channels as part of our upcoming Get On Board Day! Find Out What’s Happening Locally—Visit the website of your local public transit system—or check social media—and find out what’s planned in your area. Transit systems around the country are hosting special events and activities. Check out what’s happening and get involved. Ride Transit—The easiest way to be part of “Get on Board” Day is literally to get on board. Show your support by riding transit on Thursday, April 25. 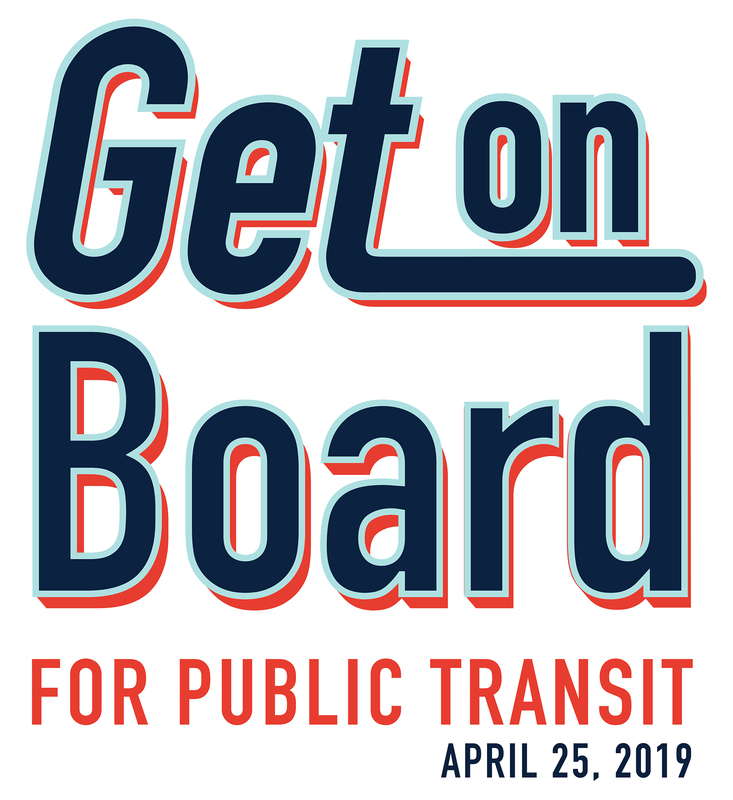 Spread the Word—Let friends, family, co-workers, and others know that April 25 is national “Get on Board” Day and encourage them to participate. In addition, post on social media, using the hashtags #GetOnBoard #transit. Communicate with Elected Officials—We’ll be reaching out soon, so you can communicate directly through email to your members of Congress, as well as state and local elected officials, letting them know you’re participating in “Get on Board” Day because you support public transportation. Safety is always timely, so we’re recirculating one of our most popular blog posts from 2017. It’s a good refresher on one of the big reasons investing in public transportation is so important. U.S. traffic fatalities have risen over the last two years. Expanding public transportation is a great solution to address this alarming trend. According to the 2016 report “The Hidden Traffic Safety Solution: Public Transportation,” your chances of being in an accident are 90 percent greater traveling by car than riding public transportation. Public transportation safety benefits extend beyond riders, however. In communities with strong public transit systems, transportation is safer for everyone—even those who don’t use public transportation. Transit riders and non-riders alike see their crash risk cut in half in regions with high-frequency public transportation. Vulnerable and high-risk drivers, such as teens and older Americans, particularly benefit from the increased safety provided by public transportation. In areas with robust public transportation options, higher-risk drivers are more likely to leave cars parked and use transit services, making the roads safer for everyone. Transit-oriented cities have about half the traffic fatality rate compared to automobile-centric cities. Expanded public transportation means safer travel for everyone—just one more benefit of investing in public transportation infrastructure for communities of all sizes. To new and returning members of Congress: Welcome to Washington! You have a lot of work ahead of you—and public transportation deserves your support. On January 3, members of the 116th Congress kicked off what could be a turbulent—but also productive—session. Congress is now officially divided, with Democrats controlling the House and Republicans the Senate. 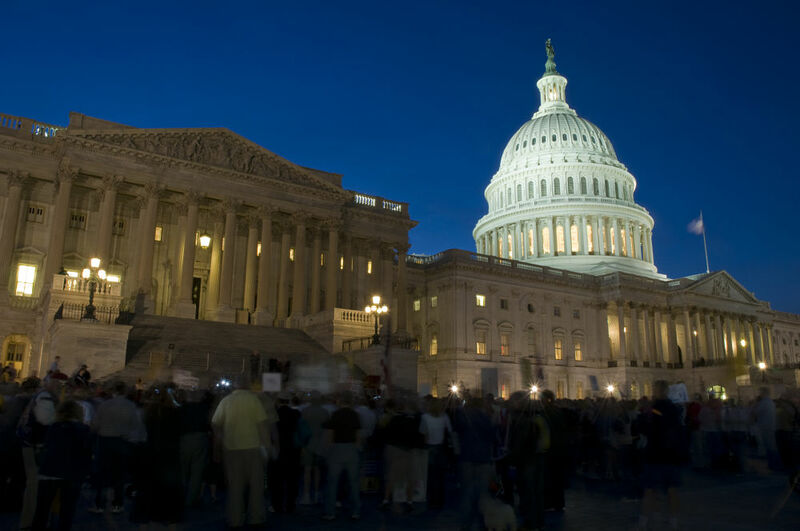 In addition, the session began under the specter of an ongoing government shutdown. Communities of all sizes depend on flexible mobility options including public transportation. The government shutdown can jeopardize riders and non-riders by impacting daily travel, professional and educational opportunities, and ultimately local economies. At first glance, the combination of divided government and partisan rancor might look like a recipe for more gridlock. But ultimately, regardless of party and political divisions, lawmakers want to serve their constituents. They want to get something done—and therefore, they must find common ground. It’s critical that Congress and the Administration work together to find a solution that will allow the government to re-open, and then focus on creating infrastructure and transportation policies that the House, Senate, and Administration can agree on. Americans broadly agree that we need increased infrastructure funding—both to address deferred maintenance and to meet the needs of a growing population and economy. Unfortunately, in 2017 and 2018, infrastructure proposals failed to advance. This year—fingers crossed—could be different. Democratic House leaders have said that passing infrastructure legislation is a major goal. Senate Republicans have also said that infrastructure will be on the 2019 agenda. Legislators now need to move from general agreement to specific legislation. As legislation is developed, our community will be speaking up loudly in support of public transportation. President Trump remains a wildcard in the debate. In the past, he has voiced strong support for major infrastructure legislation. However, it remains to be seen what his approach will be in 2019—and whether he’ll be open to negotiating with Democrats. Transportation is bipartisan by its very nature: Democrats and Republicans (and third-party voters) share roads, rail lines, and public transit systems. On this point, Congress has historically agreed. There have been decades of bipartisan support for transportation funding, including public transit. Just last year, in fact, Congress united across party lines to support increased funding for public transit in the Fiscal Year 2018 budget. Voices for Public Transit will be reminding lawmakers of our nation’s historic support for public transportation—and the need for Congress to again stand up for transit. So, let’s join together to welcome Congress—all of Congress—to Washington—and express our wishes for a successful, productive session that strengthens our nation for the future. Every American needs mobility, and Congress can help all of us by passing legislation that makes strong investments in public transportation as part of an integrated, multi-modal transportation strategy. That's a Wrap on 2018! Thank you for the amazing work you’ve helped Voices for Public Transit accomplish in 2018! We’re taking a look back on our biggest 2018 accomplishments and forecasting ahead to what could be a monumental year for transit in 2019. Congress passed a Fiscal Year 2018 budget that included big increases for transit funding. 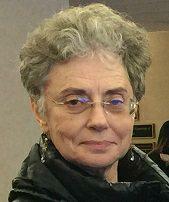 Voices for Public Transit advocates from across the country made their voices heard when word got out that public transportation was facing potentially devastating public transit cuts. Luckily, Congress responded and, while Washington is divided on many issues, legislators across the political spectrum recognized that Americans need mobility—and public transportation must be part of the solution. Public transit supporters didn’t just achieve a victory in the federal budget battle; we also made gains at the ballot box. In the 2018 midterm elections, pro-transit ballot measures won in several states. Voters approved public transit investments in California, Connecticut, Florida, Maine, New Mexico, and Virginia. Voters passed 30 out of 36 ballot measures for public transportation in the 2018 election. Those wins represent a spectrum of large cities and smaller communities, showing broad citizen support for public transportation across the nation. By now, everyone knows that things in Congress will be shifting dramatically in 2019, with the Democratic Party taking control of the U.S. House. The Republican Party continues to hold the majority in the Senate. Congress will be divided, which could spell trouble, but infrastructure is one area where consensus may be reached even in this partisan environment, allowing both sides of the aisle to claim wins on an issue that is fundamentally important to all Americans. Democratic leaders have already said infrastructure will be a top priority and the Administration and Republican congressional leaders have both expressed interest in passing an ambitious infrastructure plan. We’ll call on Voices for Public Transit advocates to stand up as the infrastructure debate takes shape next year and tell Congress that public transit investment must be part of any infrastructure bill. The 2018 elections demonstrated Americans support public transportation. We’ll remind Congress throughout the year and proactively shape the debate ahead of Transportation Bill reauthorization that’s coming in 2020. Tell us why you support investments in public transportation for your community. Make your story available for use?